EdOptions Academy is a fully accredited online school that offers award-winning curriculum, state-certified teachers, and accredited high school diplomas to schools and students who need flexible learning options. 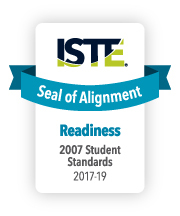 The Edmentum EdOptions Academy successfully underwent the International Society for Technology in Education (ISTE) Seal of Alignment review for Readiness. Reviewers determined that this resource helps build foundational technology skills needed to support the ISTE Standards for Students. With use of digital tools and resources required to complete course assignments and unit projects, students of the EdOptions Academy course develop a useful foundation of technology skills throughout each course. "The EdOptions Academy course materials are cleanly designed, easy to navigate and use, with high quality media content. Information is clearly presented, and with the combination of text and media elements courses are engaging and grade-appropriate." 1.b. Create original works as a means of personal or group expression. 1.c. Use models and simulations to explore complex systems and issues. 2.b. Communicate information and ideas effectively to multiple audiences using a variety of media and formats. 3.b. Locate, organize, analyze, evaluate, synthesize and ethically use information from a variety of sources and media. 3.c. Evaluate and select information sources and digital tools based on the appropriateness to specific tasks. 3.d. Process data and report results. 4.c. Collect and analyze data to identify solutions and/or make informed decisions. 5.a. Advocate and practice safe, legal and responsible use of information and technology.